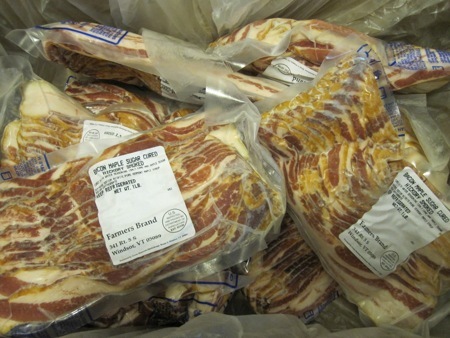 That’s eight pounds of bacon, made from the half hog I shared last month. I gave half of it to my neighbor, and stored the other half in the Deep Storage Facility. Bacon that good should be eaten straight up, not diluted by the other flavors I’d be working with. 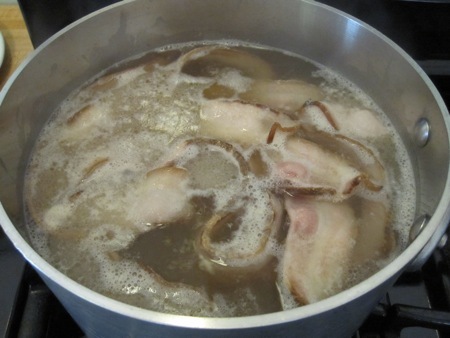 This being yet another Momofuku recipe, I started with the first sub recipe, bacon dashi. 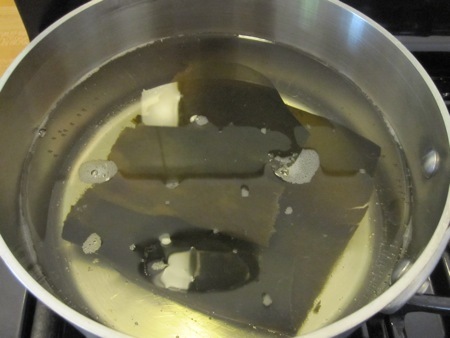 I added two 3-by-6-inch pieces of konbu to eight cups of water and brought it to a simmer, then shut off the heat and let it steep for ten minutes. 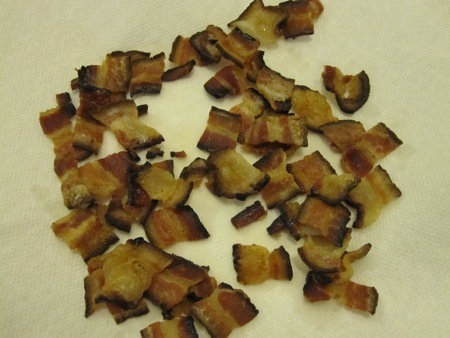 I removed the konbu and added half a pound of smoky bacon, then simmered for thirty minutes. I removed the bacon from the dashi, then chilled the broth in the fridge. When the dashi chilled, I assembled the rest of my ingredients: a pound of fingerling potatoes (scrubbed and halved), two dozen littleneck clams (scrubbed and soaked in water to purge the sand), a quarter pound of bacon (reserved from the dashi prep and cut into batons), a bunch of scallions, a cup and a quarter of canola oil, and the chilled dashi with the solidified fat removed. 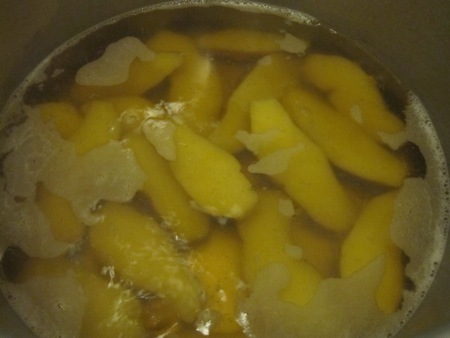 I simmered the potatoes in the dashi until they were tender, about fifteen minutes. While the potatoes simmered, I crisped the bacon, then drained it on a paper towel. While the potatoes simmered and the bacon crisped, I prepared scallion oil, another sub-recipe. 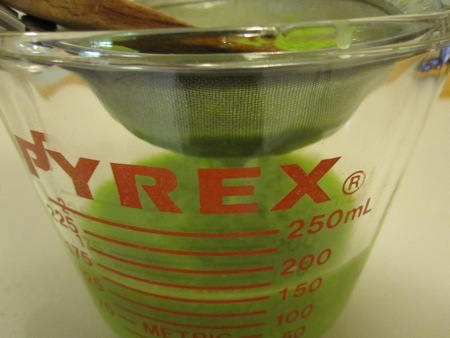 I chopped the scallions and added them to a blender with the oil and a teaspoon of salt, puréeing until they were almost completely emulsified. I passed the mixture through a fine-mesh strainer. I passed the strained mixture through the strainer a second time as I moved it from the measuring cup to a squeeze bottle, following Keller’s axiom of never moving a sauce from one container to another without straining it. 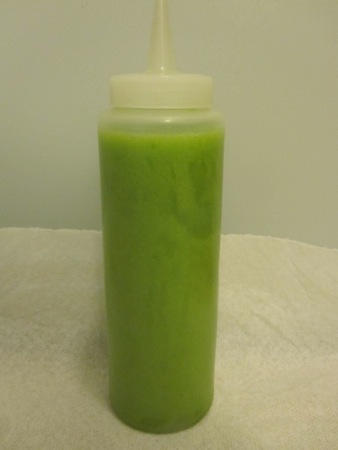 I wound up with a bottle of brilliant green oil. 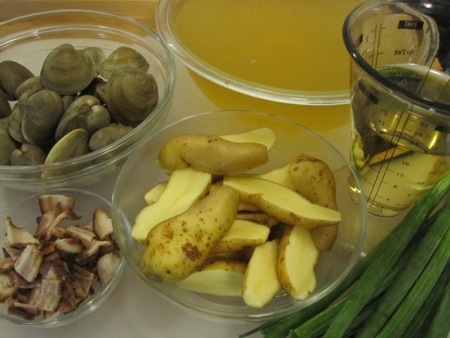 When the potatoes were tender, I removed them from the dashi, added the clams, covered the pot, and boiled them until the shells opened, about ten minutes. 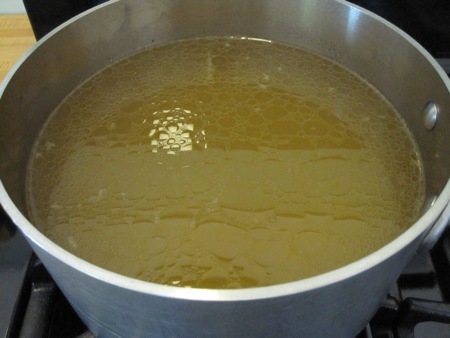 I tasted the broth and corrected the seasoning with a splash of mirin to add acid and sweetness. 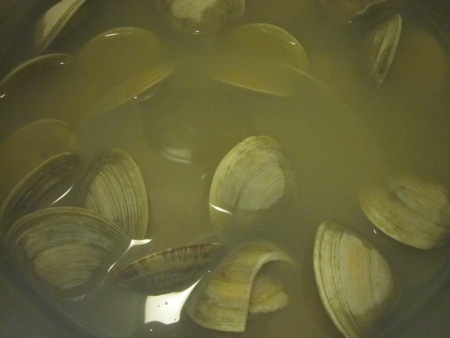 If the broth needed salt, I would have added some light soy, but between the bacon and clams the broth was plenty salty. 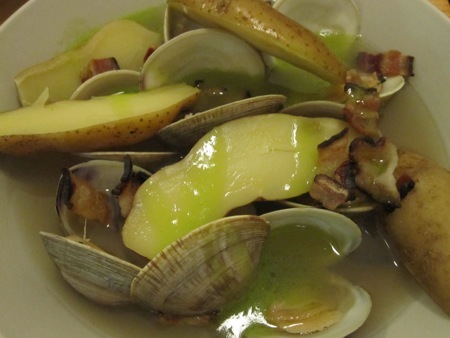 I ladled the clams and potatoes into bowls, poured in the rest of the broth (leaving a bit behind as it was probably sandy), and garnished with the bacon and a ring of scallion oil. I love good clam chowder but have never cooked it at home due to She Who Must Be Obeyed’s lactose intolerance. (She’s been a New Englander long enough, I think she should just toughen up and eat “chowdah,” but that’s not a fight I can win.) With one taste of this dish, however, I knew I had the perfect compromise. All of the classic chowder tastes were there: briny clams, buttery potatoes, smoky bacon, and the acid bite of the scallions. We didn’t miss the traditional cream base at all, in fact, She Who demanded that I put this dish into regular rotation this winter. Who am I to argue?